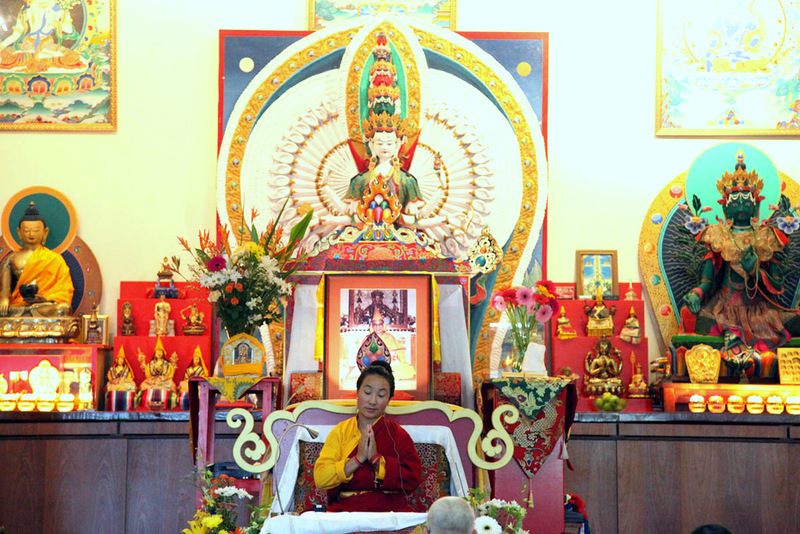 Khadro-la doing prayers in Chenrezig Institute’s gompa, Eudlo, Australia, April 2014. Photo by Eva Mueller. A symphony of birdsong; a sunny, subtropical morning after days of rain; breezes flowing through the rainforest into the immaculately prepared gompa; the scent of flowers and incense – what a beautiful moment it was as Khadro-la stepped into this scene, preceded by her faithful attendants and interpreter. Her radiance, truth and beauty further illuminated our surroundings – her presence incandescent! It is no exaggeration to say that Sangha and students were transfixed by the depth of Khadro-la’s teachings. Always humbly reminding us that she was not qualified to instruct on such matters, Khadro-la’s gentle humility pervaded the entire retreat. A living example of Buddha’s words and always speaking with great tenderness, Khadro-la emphasized the importance of placing complete reliance on the guru by choosing to give most precious oral transmissions of The Inseparability of the Spiritual Master and Avalokiteshvara by His Holiness the Dalai Lama. 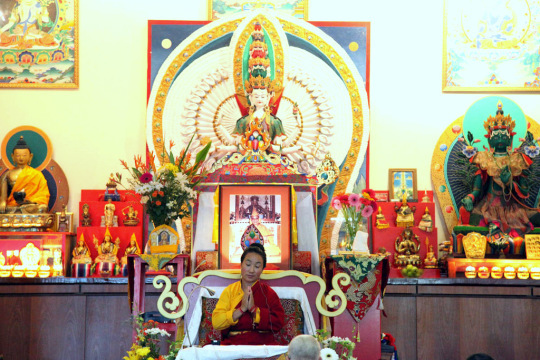 Khadro-la’s profound teachings covered aspects of the path dear to her heart, bringing fresh and rare insights into the Dharma for all, whether novice or seasoned practitioner. Among many, many precious teachings, Khadro-la spoke of the necessity to develop the wisdom that understands reality in order for altruism to increase. She also discussed the aspiration and realization of bodhichitta and emptiness, gave a discourse on the benefits of virtue and the negative effects of non-virtue, and explained why meditation is elemental to Buddhist practice. Chenrezig Institute is most grateful to Khadro-la, His Holiness the Dalai Lama and Lama Zopa Rinpoche for this exceptionally beautiful experience of the Dharma. 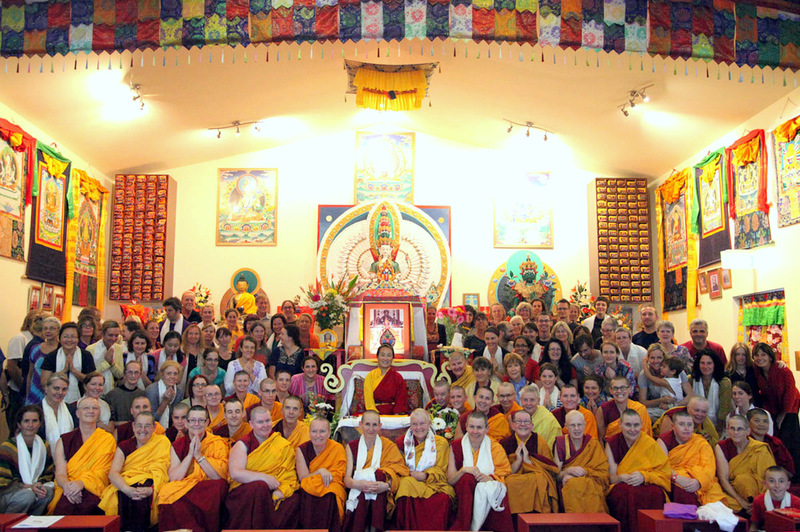 Participants on “Illuminating the Path of Wisdom and Compassion,” Chenrezig Institute, Eudlo, Australia, April 2014. Photo by Eva Mueller.